The garage comes in kit form with a set of comprehensive instructions to help you build it. 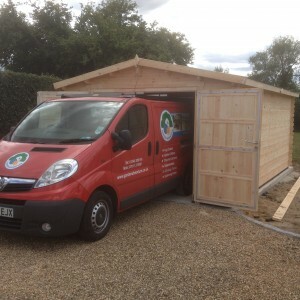 Of course, if you would rather, why not employ one of our professional installation teams to install the garage for you, it may be cheaper than you think ? Take a look at our rates for installation here. This kit, indeed all our garage and carport combinations are supplied without a floor kit. If you have plans to use the building as a workshop, you may wish to consider purchasing the optional floor kit, please contact the office to confirm pricing. If you are in need of a new garage, then give one of our garage kits serious consideration, they will probably tick more boxes than you think not least of which is the very competitive pricing !